You may want to request that the vet test for heavy-metal toxicities (zink and lead). If your parrot tests positive, have the cage tested. 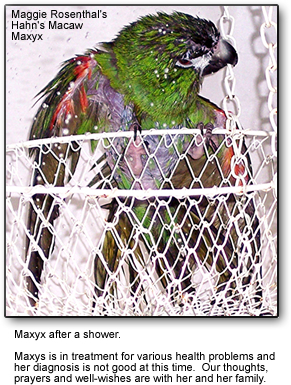 Birds suffering from heavy-metal toxicites have been known to start plucking and/or mutilatiing themselves. Discuss that possibility with your vet. Correct it as appropriate, seed is completely unbalanced in most cases. Balance seed with soaked/spouted pulses, introduce fruit and vegetables - grated is often more palatable and less threatening / abnormal in appearance. Use supplements, it is impossible to provide the variety available in nature. Complete diets are available and may be better than some made diets, compensation for lack of non-nutritional stimulation of a natural diet may be necessary. Patience - some birds may take 2 years to molt damaged feathers, few will look better quickly. At worst PBFD or Polyomavirus may warrant euthanasia. Behavioral modification. Providing positive reinforcement and redirecting your bird's energy towards non-destructive activities.